A few weeks ago, a post was brought up on the MCRR page about a local 5k that would be happening in town. An eagle scout had planned his big project as a 5k for Type 1 Diabetes awareness, in honor of his sister who was diagnosed when she was 7 years old. If you remember, I’ve done fundraising for the Juvenile Diabetes Research Foundation and American Diabetes Association, so this 5k was something that I couldn’t miss. With an 8am start, my normal Saturday morning was completely thrown off, but I did enjoy sleeping past 5am for once. I got up, got ready and was out the door by 7:15 to get to the race early for registration and a warm up. 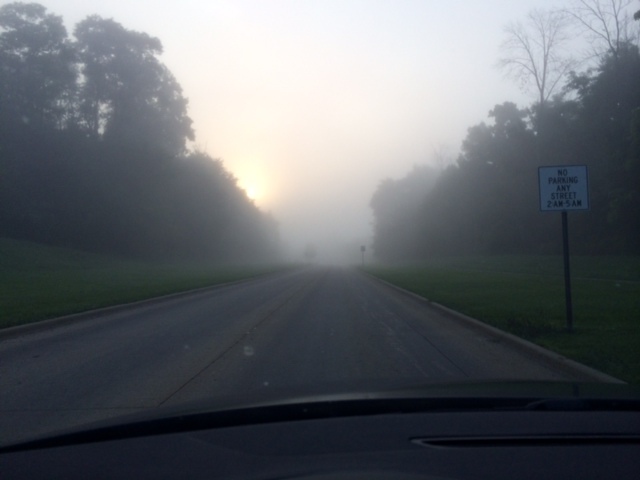 Once I got out the door, I was greeted by a thick cloud of fog and some pretty heavy humidity. Beforehand I didn’t know much about the race or course, as it was all race day registration and no course map was available online. There was no charge for the race, but donations were appreciated. 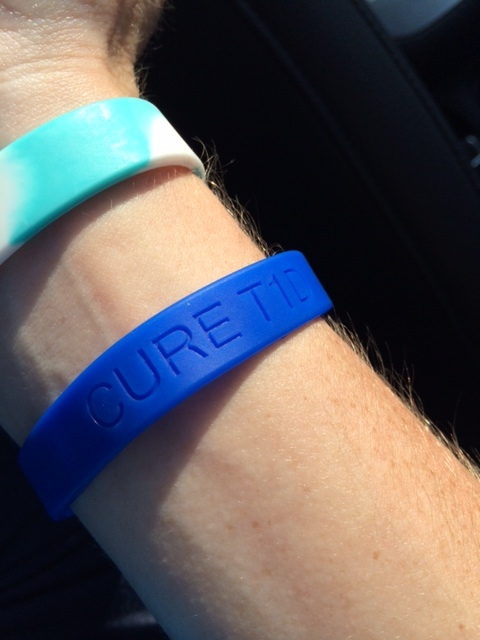 In return you received a blue wrist band from JDRF. I was pleasantly surprised with the turnout, probably around 50 people showed up to help this young man out. After about a mile+ warm up, we met on the track at the middle school and got instructions on the race as well as information about Type 1 Diabetes. I couldn’t help but almost tear up after seeing how much had been put into this race. With final instructions done, we lined up on the track and were ready to go. Unfortunately, I don’t have my splits since my Garmin had a total meltdown and I wasn’t able to upload it in time. We started off with a lap on the track, and I tried to find a comfortable pace knowing that it was a little hotter than what I was used to. I was hovering between 7:58-8:01 pace and was feeling great. Once we finished our lap, we made our way onto a path and back near the elementary school. From this point on we were on all grass, and the race quickly turned into a cross country course. Not expecting this, I tried to slow myself down because I knew I wouldn’t be able to keep up the quick pace on the grass. During the first mile I could feel myself slowing down, but I was still feeling ok. I tried to watch my footing, because the last thing I need is an injury from a 5k. We were in and out of the shade as we made a large loop in the grass. It wasn’t until about the first mile mark that I noticed how many people had dropped back. I was currently sitting in 4th female and probably 8th/9th overall. I grabbed some water at the water stop and was thankful for the fluids. It was also around this point that I had a young boy right next to me that I just couldn’t shake. We made our way around the giant loop again, and just before the second mile marker, I was able to pull ahead, leaving the young kid behind. With a mile left to go, I was starting to feel worn down. My legs felt tired from the uneven ground, and I was sweating more than I think I ever have. We came up around the front of the middle school and along the sidewalk next to the road. I was finally able to get some speed and noticed that Liz, the 3rd place female had disappeared. I continued on my way, making it through the last section of grass before we made a final lap on the track. That lap felt like the longest lap ever, but it was nice I was able to see who was in front of me. About 200 meters in front of me, was the 1st and 2nd place female, and about two other men were finishing up on the track. I had my final kick in the last 150 meters and finished up 3rd place female with a time of 28:06. This definitely wasn’t your normal 5k, but the meaning behind it was the most important thing to me. There was no official timing or places/awards so I can only go off the time that was yelled out as I crossed the finish line. My time was much slower than what I anticipated, but based on the fact the course was about 90-95% grass, I’m not really surprised. I’m so glad I made the time to come out for this 5k, and I’m proud of the eagle scout for accomplishing his goals with this race.